Investment in North of England tech companies has reached a 10-year high as investors worldwide target the region’s fast-growing digital sector, according to research by private equity firm Livingbridge. The research, conducted with Experian Corpfin, revealed that 206 deals involving Northern tech companies were completed in 2018, almost double the number seen in 2009, following the UK-wide recession, and 10% more than in 2017. The overall value of tech investment in 2018 also soared, with more than £2.3 billion completed in 2018, up 77% on the value of deals in 2017. In the last decade, a total of 1,585 deals were completed, with £22 billion invested in tech businesses across the North of the UK. One of the biggest recent deals seen across the region was the £235 million investor buyout of Chorley-based ParkingEye Ltd from Capita Plc. ParkingEye’s car park management system uses automatic number plate recognition software to help supermarkets ensure their spaces are available for customers. Other landmark deals included the £40 million fundraise by Cheshire-based Blue Prism Group, the provider of automation software, through a primary placing of new shares. Matthew Jacobs at Livingbridge, said: “With an exceptional talent pool, the North West has forged a reputation as a global powerhouse for digital investment. “Businesses across the region are continually trailblazing in their respective fields, producing cutting-edge tech solutions and snapping up gaps in the market with new innovation. 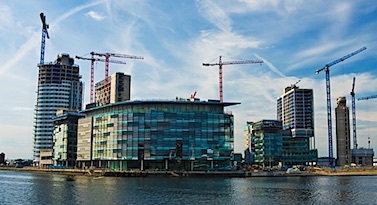 “With MediaCityUK and a raft of large-scale ecommerce headquarters such as AO.com and Boohoo, the North West is a hub for creative, digital and ecommerce tech. “A particular point of difference for the region is Manchester’s ‘Data City’, a data science and software company which uses open data, online figures and artificial intelligence to comprehensively map the region’s emerging tech capabilities, the only one of its kind in the UK. “Last year we saw a rise in investment across the sector, from fintech to computer manufacturing, and it is interesting to see a large number of deals backed by overseas investors, with the US a particularly prominent player.